Absolutely Legless - Neil Drover - agency for live music, presenters and entertainers. 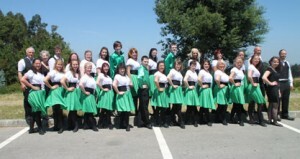 Absolutely Legless is a group that creates an imaginative and exhilarating combination of Irish dance and music. They are available to book for ceilidhs, concerts, festivals, workshops and corporate events. Recent appearances have included Towersey Festival, Sidmouth International Festival (supporting Sharon Shannon), Fiddle 2001 in Edinburgh, Both Sides the Tweed in the Scottish Borders and The Heart of Scotland Festival in Aberfeldy (supporting Andy Irvine).